Count Time Inc. among the companies hoping that the iPad gives the publishing world a jolt. The magazine publisher has already come with an edition of its Time Magazine news weekly designed for Apple’s tablet. 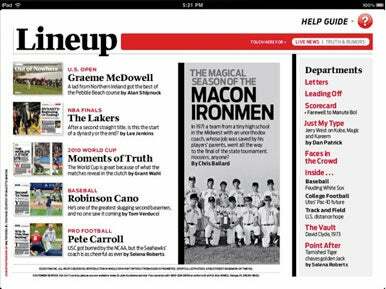 Last week, it began offering an iPad version of Sports Illustrated, the weekly sports publication. It’s no surprise that a mobile edition of SI was in the works. The publisher previewed a proof of concept video on YouTube late last year, showcasing the magazine on a generic tablet. The resulting product, released last Thursday amid the iPhone 4 frenzy, incorporates ideas from the concept video nicely (sans those creepy CGI hands). The app provides scan-through as well as swipe-though navigation of the magazine’s issues, while a widget called “The Wheel” will allow users to send their favorite story or photo to Facebook or Twitter and suggest similar stories they might like to read. Weekly content includes “the best of the magazine and SI.com,” as well as an assortment of additional features. The first week, which was available last Thursday along with the app, includes a video documentary, an interactive mock NBA draft, a panoramic photo of Pebble Beach’s “Cliffs of Doom” (wtith highlights on the golfers who played there and their hole strategies), and an SI Original piece entitled “The Worst Team Ever,” a piece by sportswriter Jimmy Breslin on the 1962 Mets. The app itself is free, with in-app purchases of each week’s magazine costing $5 (even if you already subscribe to the dead-tree version of the magazine).